This is a chart of the Dow Jones Industrial Average during the first year of the administration for each of four Presidents. We decided to chart the administrations of Franklin D Roosevelt, Ronald Reagan, Bill Clinton and Barack Obama (current). Both FDR and Obama inherited grave economic crises, while Reagan inherited a damaged market due to the malaise of the 1970s. Clinton, as many readers may know, presided over a successful U.S. economy. 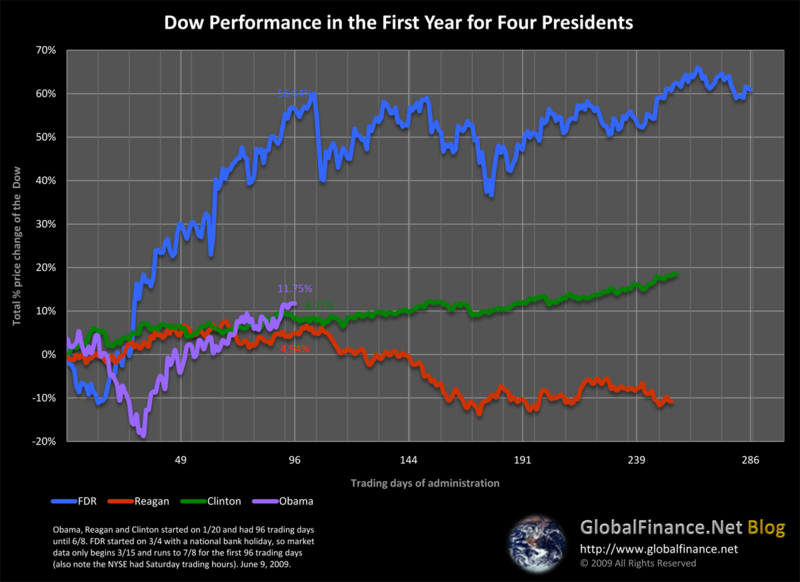 The chart compares market performance day by day (the daily percentage change in the price of the Dow) for each of the four Presidents. Note that the actual data points for FDR are not directly comprable with the other three as the market was closed for the first two weeks of FDR’s administration and the market held Saturday trading in the 1930s. Our chart is below, please click on the chart for a larger version. You can follow this theme in the blog along with our other chart blogging at http://www.globalfinance.net/category/charts/.